Lollar Blade Style pickups are featured on the "Phoenix"
We wish Scott Walker, of Scott Walker Guitars, the best of luck with one of his newest releases – the Phoenix. This project actually started in 2007 with Scott and Steve Kimock, and a conversation about guitar ergonomics. Some time later in that ongoing conversation Steve contacted Jason to seek some advice about pickup design. Jason recalls that Steve had some specific goals in mind, and the two of them worked together to try to accomplish what Steve was “aiming” for. Steve had purchased a number of Lollar pickups over time, including a few custom items. For example, Steve had liked the Charlie Christian blade style concept, and he had previously asked Jason to make a custom blade style pickup in a single coil design fairly similar to a Strat build. In other words, a taller pickup with a more focused, brighter sound. But for the project that eventually turned out to be the Phoenix, Steve became intrigued by the wider, flat shape of a Jazzmaster style pickup. Something that would be less bright than the tone that is created by a taller, narrower coil. After the overall coil shape was identified, two more related elements came into clear view – the blade and its overall extension beyond the normal center-to-center outside string spacing. In other words, Steve wanted the blade to extend further beyond each side of the high and low strings so that there were no drop-outs when string-bending, and so there would be no drop in response in the high E string. The blade itself is also an important feature of the pickups. The blade does two things that affect the overall function of the pickup. A ferrous (iron) based blade propagates the magnetically field differently than individual pole pieces. The blade also increases the inductance of the pickup. Inductance is a measurement of a pickup’s ability to convert the physical vibration of the string and convert it into and electrical signal. The end result is that the pickup will give you a fuller sound, a little more overall output, and a longer sustain as compared against a Fender style Jazzmaster pickup. We wish Scott the best of luck with the new Scott Walker Guitars Phoenix. 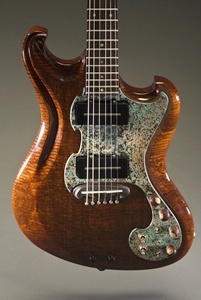 For more information on the guitar, you can go directly to the Scott Walker Guitars web site. This entry was posted in Announcements, Merchandise, Miscellaneous, New Products and tagged Lollar blade style Jazzmaster, Lollar blade style pickup, Lollar Kimock Jazzmaster, Lollar Kimock pickup, Scott Walker Guitars, Scott Walker Phoenix by admin. Bookmark the permalink.